A Black Lives Matter activist named Jessica Disu has called for the police to be abolished during what was called a heated discussion on the Kelly File, as reported on Fox News. A Black Lives Matter activist from Chicago argued during a heated Kelly File discussion that American police forces should be abolished. “Here are the solutions. We need to abolish the police, period. Demilitarize the police, disarm the police, and we need to come up with community solutions for transformative justice,” said Jessica Disu, drawing some shocked reactions. The conversation started with Megyn Kelly asking the panel – which included Black Rights Matter supporters, law enforcement officers, conservative commentators and religious leaders – about some who praised the Dallas gunman. Disu, who described herself as a community organizer, said that Black Lives Matter has never called for violence against anyone. “We need to come up with community solutions. The police force in this country began as slave patrol,” Disu argued. The suggestion is not actually as crazy as it sounds. We believe that having a professional, uniformed, quasi-military style police force is essential for maintaining order in our communities, but in fact, the idea of a body of police officers with the duty of capturing criminals and investigating crimes is a surprisingly recent one, dating back only to the early to middle nineteenth century. Before that time there were no policemen, as we know them. Of course, there have been officials charged with maintaining law and order for as long as human beings have had governments, various forms of county sheriffs. town constables, city watchmen, etc. For the most part, these officials have had the duty of enforcing court orders, serving warrants, responding to citizen’s complaints, and keeping order. Pursuing criminals wasn’t their main function. In most cases, in the ancient and medieval eras, it was up to the victim of a crime and his family to resolve crimes committed against them and to bring the criminal to the attention of the magistrates. Often, there were no public prosecutors, as we know them, and it was up to the victim to bring charges against the criminal in court. If the identity of the criminal were not known, the victims could hire a thief-taker, something like a modern private investigator, to track down and capture the criminal. This system probably worked well enough in a Medieval setting of a rural country with small villages where everyone knew each other. Social pressure would have prevented most people from committing crimes and it wasn’t too difficult to discover who was responsible for a theft or murder, etc. It perhaps worked less well in the larger cities of pre-industrial Europe, but conditions were probably manageable, at least for the elite. With the industrial revolution, cities such as London or Paris began to grow in population to an extent unprecedented in European history. There were large numbers of people moving to the cities in search of jobs and as a result crime increased to unprecedented levels. It was becoming obvious that something better was needed. Robert Peel is often credited with establishing the first metropolitan police force in London in, although the gendarmes established by Napoleon in France anticipated his reforms in some respects. Robert Peel was a Conservative politician who would go on to become Prime Minister in 1834-1835 and 1841-1846, when he would prove himself to be something of a reformer. In 1829, Peel was serving as Home Secretary and had become greatly concerned over the rise in crime in London and other British cities. Acting on the recommendations of the committee he had created to resolve the problem, Peel got Parliament to pass the Metropolitan Police Act which created the first, tu, metropolitan police in history. Strange as it may seem, the idea of having uniformed police patrolling the streets of London was fairly controversial when the Metropolitan Police Act was passed. For many Londoners, the idea of a semi-military force keeping order seemed more fitting for the despotic regimes of the Continent than for a free country like England. The freedom loving Englishmen, along with their former colonists in America had a particular horror of a large standing army as an instrument of tyranny. Kings used such forces to impose their will on the people. For this reason, Peel was anxious to emphasize that the new police force was not a military organization, but was a politically neutral body accountable to the public it served. The police wore blue uniforms, in contrast to red worn by British soldiers (redcoats) and carried no weapon except a club and a rattle, later replaced by a whistle, to call for assistance and he used no military ranks, except for sergeant. Above all, Peel saw his new police force as part of the public, not as something separate. “The police are the public and the public are the police”, he often said. The London Metropolitan Police proved to be effective at controlling crime and police forces based on Peel’s principles were soon organized in other cities in Britain and the United States. Professional police forces like Peel’s have become the norm all over the world to the point where it is simply inconceivable for a modern society to be run without them, yet I wonder what Robert Peel would make of what we have made of his creation. I think he would be alarmed at the extent in which his critics have been proven right. Remember that the most important principle on which Peel organized the London police around was the idea that the police were not soldiers occupying the city of London but were a professional, civilian organization dedicated to serving the public. Somehow, over the last century that principle has been eroded. All too often, the police today are organized on explicitly military lines with military-style ranks, uniforms and training. We have heavily armed police officers in armored personnel carriers and Special Weapons and Tactics units being increasingly used to perform the normal duties of police work. Inevitably, people who are trained almost as soldiers begin to act like members of an occupying army instead of public servants, particularly in areas where the ethnicity of the police differs from that of the community. They become warrior cops instead of public guardians. I do not favor abolishing the police. We cannot go back to the simpler times in which a society could get by with informal law enforcement. Yet, maybe it is time to have sort sort of public discussion what sort of law enforcement serves us best in the twenty-first century. We may want to move away from the warrior cop model in which the police become almost as dangerous to civilians as the criminals towards a police force more integrated with the communities they serve. 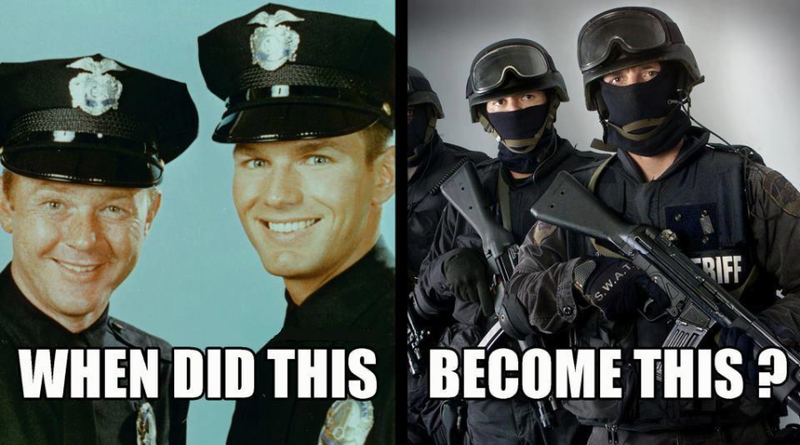 Demilitarizing the police seems to be a good first step. we certainly want to stop this tendency to see the police and the civilians as somehow being opposing sides. Both the police and the public, at least theoretically, want the same things; safe places to live. For this reason, movements like Black Lives Matter and community organizers like Jessica Disu are doing more harm than good. By all means, police officers who break the law should be punished, and the police do not do their side any favors when they refuse to assist in the prosecuting wrongdoers in their ranks, but it is reckless and irresponsible to paint all police officers as racists bent on killing black men for no reason. This antagonism can only make needed reforms more difficult to enact, particularly when abuses which should concern everyone; Black and White, police and civilian become a matter of Black versus White and police against the civilians. We all have to learn to stand together or we will fall divided.